In the spirit of racial harmony, I have, for several days now, been thinking that I have to stop dressing like a white man and get with the Hoodie program. After all, isn't it better that we all learn, like Reginald Denny to "just get along?" (Or was it Rodney King? So hard to remember all the post-racial celebrities, isn't it?) Isn't it also safer for WASPs to Africanize now that we live in a nation where very marginal, very demented, and very repulsive groups such as the "New" Black Panthers can offer bounties on the head of anyone they dislike because of the color of his skin? Do I really need a weatherman to know which way their skin blows? But how best to do that? At first I tried skin-tinting, or as my dermatologist likes to say, "reverse Jacksoning." Alas I quickly discovered, as millions of my fellow Americans of the African persuasion have discovered, that it just isn't that easy to change my hue. The other night I steeped in a bathtub I'd filled with hot water and 496 Black Teabags. I was hoping for some sort of mahogany tint by midnight but all I got was a transdermal caffine rush. Yesterday morning I briefly applied a gallon of walnut body paint but one glance in the mirror and I recalled that running around in blackface, or even walnutface, was frowned on from every official African American from Lewis Farrakhan to Rachael Maddow and that albino president Bill Clinton. Hence body paint was right out. Following that I considered a full body tattoo using India Ink but the process of covering half of one cuticle was so painful I backed out of that one too. It was clear to me that the only thing I could do was to dress like a brother. Fortunately I've had a lot of help with over the past few days from a gazillion white folks who also want to "African-American up" in the ever-popular hoodie. The hoodie, of course, is a perfect marker for African-Americaness because -- as we have been taught assiduously by glorious television shows such as the Wire and endless rap videos -- to wear a hoodie is to take on the aspect of the clean-cut and honest African American without any criminal overtones attached to such a garment at all. All those black hoods and thugs in hoodies you've been seeing and hearing about for years you did not, it turns out, see at all. Your eyes and ears were lying to you the whole time. Of course, dressing in a hoodie in support of my African-American non-hood hoodie wearing fellow citizens was hard for me since I was, I am deeply ashamed to say, born white. Not just white but worse, WASP. As such I can't just boogie down with my bad self to the half-block ghetto of Seattle and grab me a genuine hoodie. As a WASP I not only don't know where the Hood Hoodie Store is, I am not allowed to know. Hell, I don't even know where to find the stores that sell those special baseball caps that have the bill sewn onto the side. The bottom line is that I am just too, too white to wear a brother's hoodie. It's not my fault. I was born this way. But this morning, thanks to Rodger the Real King of France at Curmudgeonly & Skeptical I found an answer. 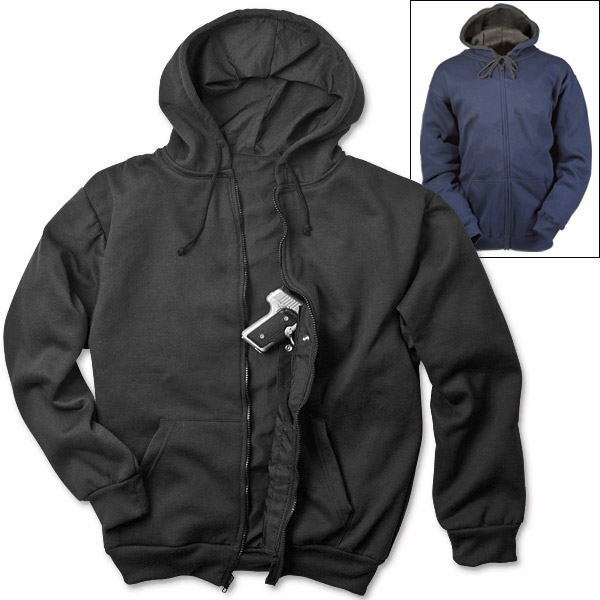 I found a hoodie that was a compromise between the Hood Hoodie and the Neighborhood Watch Hoodie; a hoodie that, like our current president, brings us together at last: The NRA Concealed Carry Hooded Sweatshirt! Sounds just great, doesn't it? Sounds like something that can be worn with pride by every American from the Klu Klux Klan to the New Black Panthers! Sounds like something that will, like our half-white, half-black president, really bring us together at last. At least until we have to reload. I'm thinking of ordering seven. One for every day I get to wear one in Barack Obama's new "post-racial" America. How about you? Husband gave me a hoodie for Christmas, 2004. He got it at The Gap, and it says "Jackson Hole" on the front. We lived down on a bay, and I thought it would the right weight to keep me warm. But it just screams "white," so I probably wouldn't get any street cred for wearing it. But the pocket on the front is definitely big enough for my .38. A strong-side holster gives you a much cleaner draw than one that requires you to unzip and move across your chest, especially if the bad guy is in close. Use the hoodie to cover the IWB holster. This whole story has been blown way out of hand. It's amazing how one isolated incident between a neighborhood watchman of Latino ethnicity and a black teenager can spark so much turmoil between whites/blacks. It's obviously fueled by the relentless New Black Panthers, Jessie Jackson, Al Sharpton and Obama. They have nothing better to do than stir the racial pot. This and the so-called "fight against women's rights" are just examples of the kind of crap we are going to have to put up with until the election, because the current occupant of the White House wants to stay there, but he doesn't have any accomplishments he can use to sell his second term to the voters. All he can do is make noise, stir the racial pot, and line up the troops of the renamed ACORN and the Democrat Secretaries of State to make sure that all the dead people vote, all the lefty college students and union thugs vote in two or three different states, and try their best to steal the election. Our job is to insure that he loses by such a large margin that the election cannot be stolen. Not only will that concealed carry hoodie give you simultaneous street cred with the NRA and those in da hood, but if you get it in black, it'll give you membership into that Black Bloc group of happy anarchists the next time a G-7meeting comes to town. I heard that Allen West was going to sneak onto the floor wearing Hoodie Footie pajamas in response to Bobby Rush vainglorious attempt at sympathy. Tonight Al Sharpton filled the airwaves with his brand of dyslexic rage opining that Trayvon Martin was killed and all he had was Skillets and Iced Tea. My wife is so turned on by Hoodie Chic that wearing a hoodie is the only way I could get any action around here. Of course, I don't actually GET any action around here because my wife accuses me of trampling on her reproductive rights---which makes me suspicious as she had a hysterectomy 20 years ago. %#@! *ing hoodies. "...Trayvon Martin was killed and all he had was Skillets and Iced Tea." You can do substantial damage (in fact, a LOT of damage) with skillets, Ms. Jewel. Al Sharpener straightens his hair with a hot skillet. And NOW look at him. A foul excrescence. I've been a hoodie most of my life, of course I ski 100+ days a year at 11,000 feet in winds up to 100mph. Been a whitewater rafting guide and a commercial fisherman also. Somehow I think we wear hoods for a different reason. I'd love to take some of those punks out in a small boat in 30 ft seas and watch them wet their pants. Why is vigilante justice OK for blacks, but not OK when taught about in history and racial studies ? Looking for scapegoats? Let's blame the sugar rush from skittles and caffeinated tea for Trayvon's reaction ? Why not ? Even more to the point, why do white people think that it makes them hip to act/dress/talk like low-class ghetto trash? Ever since the '50s, I've been slack-jawed at the notion that white suburban kids were so ashamed of their parents that taking on the mannerisms of ignorant thugs qualified as a statement of some kind. You wanna emulate somebody black? Try Bill Russell, or Duke Ellington. Or Allen West, for Chrissake. Put on a clean white shirt and wear a tie. Another good one Gerard. Thanks for the entertainment. As to the racial double-standard and the self-loathing many whites express: my view is that culture is like capitalism. The best results are achieved when people mostly try to improve their own lot. It's the give and take of all trying to make an improvement that makes a general improvement for all. Many whites have simply stopped trying to make an improvement in their situation, perhaps thinking they will get credit if they put others first. Others recognize this and use this knowledge to make unreasonable demands. It's much easier for a group to get more by making you change than they change. It's a type of racial socialism. The most racially cooperative people quickly become racial chumps. The economy doesn't get better if the masses are expected to ignore their individual wants and needs and work for the community's good. Whites need simply to stop looking to others to validate we are good enough. No other racial group has done more to help people of all races improve their lives, not to mention our innovations. There is nothing more ignorant than judging an individual by their race. But a good person will work to disprove their racial stereotype. Bad people will simply tell you to stop believing what you are seeing. Act like a thug you are a thug. Act like white trash, you are white trash. It's not my job to know your soul, it's your job not to put obstacles in your own way. I beg you to turn off pop culture media and read books or long form magazines. A great way to transition from TV to books is CSPAN's BookTV.org CSPAN-2 spends all weekend airing authors presenting their books. CSPAN has put every bit of it's content on the net. You can watch any of these author presentations any time you want. There is far more interesting things in a random history book than flaming celebrities dancing and singing. I think you will find if you increase the depth of your knowledge, rather than the speed with which you learn televised trivia, you will be better informed and less susceptible to media frenzy. Bill Bellicheck, head coach of the New England Patriots and known white man, is notorious for wearing hoodies on the sidelines of NFL games. Just sayin'. And wait'll you see the "Jesus wore a hoodie" meme-- it's out there! Made with DuPont patented durable Trayvon™ fiber. "Wow, a bunch of people in hoods wanting to lynch some guy." Nobody learned anything, did they? I actually have one of the NRA hoodies (and number of others). The problem with them is if you try to carry anything in them larger than a 'piss-em-off piece', it sags noticably. I myself am a fan of large hole makers, so either a clip-in side slide or a belly band are the choices. Slider it is. sold out until June, all colors, all sizes..
You need to get your woman the "Flashbang" holster.